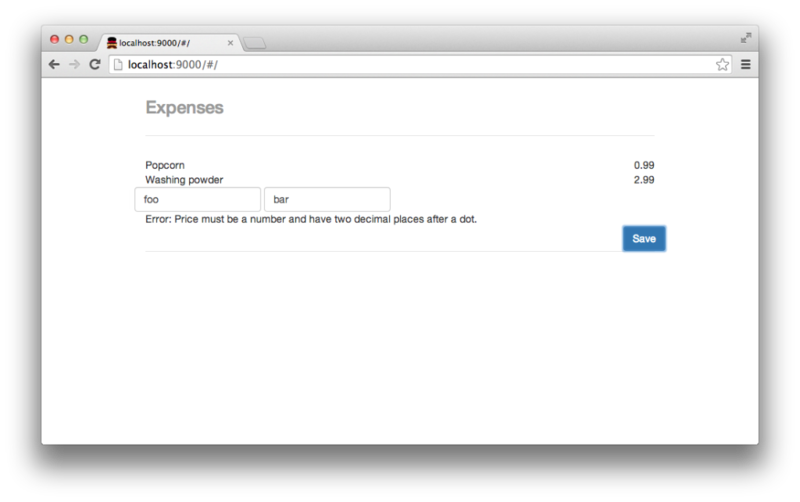 We will focus on a small app to track our expenses. There will be a commit for every step, and sometimes the commit also includes tests. The tests will not be a topic in this tutorial, but if you are interested in it you should have a look! You will find the whole code that is used in this tutorial in a repository on GitHub. Some of you might say that we could use client side alternatives instead. IndexedDB or Local Storage are technologies that work locally on the client to persist data. But using a database server has several advantages: we can connect with many clients to our app. Your partner could update the expenses list while you are on your own in another supermarket, also adding expenses. And, if we would want to use replication for our database, it would be as easy as slicing bread: as CouchDB is designed for creating distributed database systems. For this Tutorial you will need to install the latest release of CouchDB (1.6) and the latest stable Node.js (currently 0.10.x) release. As a Mac user you can get an official installer on the Node homepage. Another way to manage Node.js installations on Linux and OSX is the awesome nvm from Tim Caswell. We will install Yo to scaffold our app. Yo will ask us some questions during the process of creating our skeleton. Yo asks if we want to use SASS, and if you are unsure just answer “no” – but we definitely want to include Bootstrap and the preselected Angular-Modules. With the command grunt serve a development server gets started and http://127.0.0.1:9000 should open in a browser after the grunt tasks have finished. An example of this is shown in the following image. There are awesome docs for installing CouchDB on a lot of platforms – there are packages for all major operating systems and on OSX you can use brew to install CouchDB. We just created our first database by using HTTP! Let’s explore the HTTP API of CouchDB further: we can now insert the first document, let’s say we want to track some popcorn we bought (we will need these calls to CouchDB later for our application). Our client will communicate via HTTP from another location than CouchDB itself. To make this work in our browser we have to enable CORS (Cross-Origin Resource Sharing) in CouchDB. With those two commands, we are changing the local.ini of CouchDB. You can find out where the local.ini is located using couchdb -c.
Important! Please note that you might want to change the origin section if you deploy the app to production. All settings provided here are just for development! The $routeprovider in this file is a good example of Angular’s dependency injection (DI). By defining the name of the service you want to use, Angular injects it into the given function scope. You can find further information regarding Angular’s dependency injection in the docs. The only controller we have so far, which was created during the initial scaffold, is the MainCtrl located in app/scripts/controllers/main.js. The MainCtrl gets defined and the $scope is injected. We will see how to use the scope later. 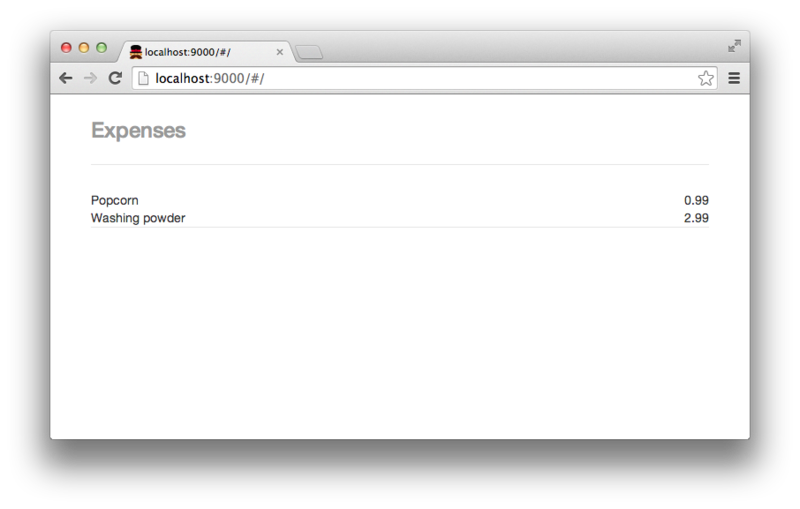 You should now be able to log output on the debug console of your browser. Congratulations! You have successfully used dependency injection. You can find the full commit at: https://github.com/robertkowalski/couchdb-workshop/commit/d6b635a182df78bc22a2e93af86162f479d8b351. In the next step we will inject the $http service to fetch the data from our CouchDB and update the view. While traditional databases are working with data that is decomposed into tables, CouchDB is using unstructured documents, which can be aggregated, filtered and joined using map and reduce functions with a concept called views. A view gets defined by a design document, a special kind of document. You can write the view on your own and send it to CouchDB via curl, use the graphical interface at http://localhost:5984/_utils or via a tool like CouchApp – there are a lot of tools like CouchApp (npm install -g couchapp) to make development and deploying of views easier. The _id is important for us as it defines the path where we will query the view later. The _id property gets prefixed by _design as we are creating a design document. We name our view byName and it just includes a basic map function, which will emit the name property of each document in our database as key and the price as value. If you are interested in tools like CouchApp (hint: you have to use it later), here is a commit which shows how to use it (use npm run bootstrap to deploy the design document). The $http service returns a promise, which will provide us the JSON data from the CouchDB view. We are adding the data to $scope.items. Using $scope we can set and update values in our view. If a value changes on our model, the view gets automatically updated. The two-way binding of Angular synchronizes our data between the view and the model. It will immediately update the view after the controller changes the model and also updates the model, when the values in the view change. The commit for this part is available on GitHub. We should now see the first item, but what for all other items? We can use the ng-repeat directive here, which will build the markup from longer lists for us. In general we can say that a directive in Angular attaches behavior to a DOM element. There are a lot of other predefined directives in Angular, and you can also define your own directives. In this case we are adding ng-repeat="item in items" to an outer div, which will then iterate on our array items from $scope.items. We have a nice small list now, but there is still no way to submit new items with our app besides using curl. The app up to this point is available in this commit, and is show in the following figure. We will add a form with two inputs: one for the item name and another one for the price. The form also gets a button for submitting our items. The divs with the class="row" from Bootstrap are used to style our app in a responsive way. The Bootstrap classes like form-control and btn btn-primary are used to style the button and inputs. The commit for the form is at https://github.com/robertkowalski/couchdb-workshop/commit/d678c51dfff16210f1cd8843fbe55c97dc25a408. We are also adding a small status box under our last item. We will need it to display errors. But how do we submit the form? Before sending the HTTP request to the database, we are doing an optimistic update of the user interface, so the user sees the update immediately and our application feels snappier. For that we are adding the item to the other items on the scope. Angular will update the view for us. Then we are doing the POST-request for our item in the background, and on success we are removing any (previous) error messages from our status field. In case of an error we are writing an error message to the view. CouchDB will tell us why the error happened in the reason property of the JSON that gets returned. To get a consistent view again, we refetch the list of our items after we received the error. And that’s it! Angular helps us a lot keeping our view up to date! Check out the latest commit. 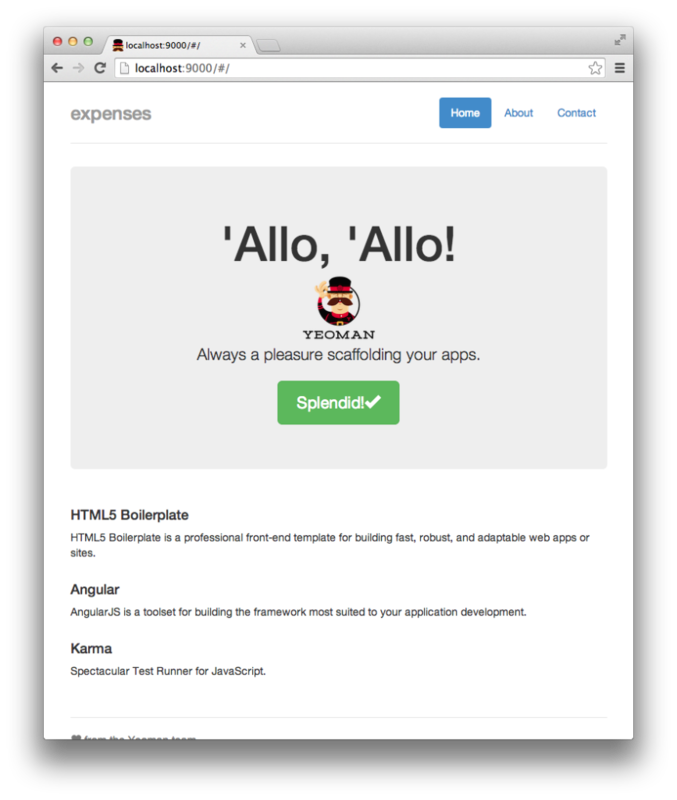 You might have noticed that we can put all kinds of values in our expenses application. People could add invalid strings like foo to the prices and send it to the server. So let’s add some server side validation: CouchDB is able to validate documents on their update. We just have to add a validate_doc_update field with a function to our design document. This function should throw an exception in the case of invalid data. It’s awesome that we have some validation on the server now, but wouldn’t it be even more awesome if we wouldn’t need a request to validate our document? Let’s add some validation using Angular. That’s it! With just a few lines of HTML we got great validations. Check out the latest commit, including tests.